Apple White™ and Raven Queen™, roommates and opposites on the destiny debate, have come together to show their school spirit. 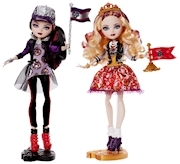 Both look hexquisite in outfits adorned with Ever After High™ iconic symbols. 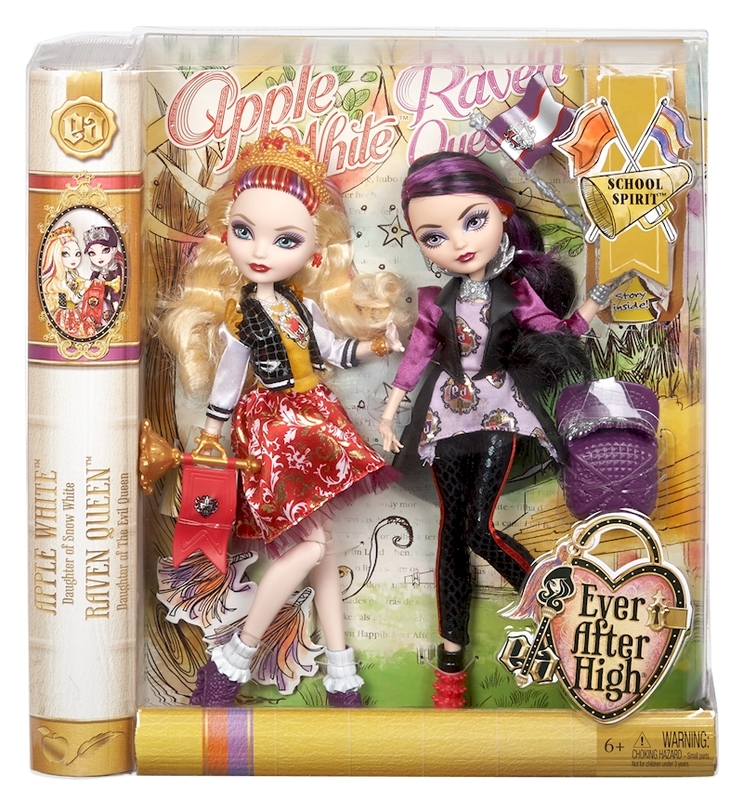 Apple White™ doll, daughter of Snow White, looks her fairest in a dress with school crest on the bodice; a red, white and golden skirt; and black and white school jacket. Enchanting accessories include boots with sculpted socks, a red heart necklace, fableous jewelry and red bow-adorned golden crown. Raven Queen™ doll, daughter of the Evil Queen, is wicked cool in a purple top printed with the school logo, black leggings and a purple and black satiny jacket. Red boots with molded socks, a silvery crown, spelltacular jewelry and a purple cap decorated with silvery filigree are spellbinding. Both carry a pennant in their signature colors to showcase their school spirit. 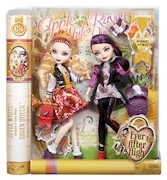 With the two dolls in one pack, girls can recreate hexciting scenes from the webisodes or Choose Their Own Ever Afters!